Tom Strickler, the newly appointed Director of Operations for Columbia Borough School District will receive a salary of $94,000 plus the equivalent of $30,000 in benefits for his year-long contract, according to ELANCO Superintendent Dr. Robert Hollister. The remainder of the $165,000 that Columbia is putting up will be deposited into ELANCO's general fund. A press contingent from Columbia news, views & reviews and Columbia Spy, as well as a Columbia resident, attended Monday's ELANCO School Board meeting and spoke with Dr. Hollister after the meeting. The Columbia resident had requested to comment during the meeting but was denied because he was not an ELANCO resident. The board president denied him the right to speak, even though he had not yet identified himself as a non-resident. Hollister explained that 10 people applied for the director's position. Five were winnowed from the original pool, and three finalists were further interviewed, from which Strickler was chosen. Hollister declined to give the names of the other applicants. Although he is technically an ELANCO employee, Strickler will run the day-to-day operations at Columbia. Hollister will come to Columbia one day a week to oversee the operation. Asked why he would do so without financial compensation, Hollister replied, "I have an affinity for Columbia." He added that he knows people from town. He said he believes the shared services agreement will give Columbia "better service at less cost." Hollister said he is the most transparent superintendent in the county and guarantees that Strickler will be "open and approachable." Hollister added that he will attend this Thursday's's regular meeting of the Columbia School Board. Strickler is also expected to attend. Transparent.......hmmmm. Then who were the other applicants? What about RTK? I would like to know the credentials of the other candidates. If they had backgrounds in education and public administration and were not selected, the appointment was a set up. Also, I pity the citizen that travelled to New Holland and could not speak. So,in conclusion, Stickler gets his way,a citizen can not speak since they did not ask before the meeting, and ELANCO, pockets the leftover $30,000. It stinks! If Columbia is in this pilot project why can't we speak at ELANCO's meetings? Strickler is clearly employed by ELANCO and working in Columbia so if we speak out at Columbia's meetings will our concerns make it back to ELANCO's board? Yet another slap in the face for taxpayers of this borough. 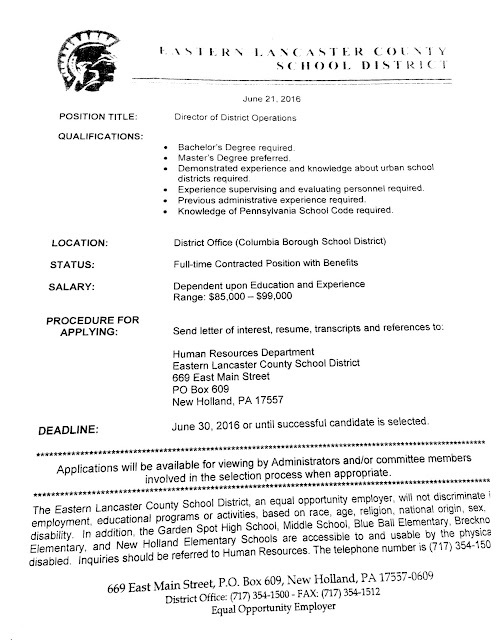 Interested and qualified applicants can apply through the district application portal at https://neshaminypa.tedk12.com/hire/index.aspx. Please include a letter of interest, resume, three letters of professional reference and required clearances (PA Criminal Record check; FBI Clearance (Registration number) and PA Child Abuse clearance). Applications are accepted through August 30, 2016 or until position is filled. And gives a much longer application period. And is advertised to a broader audience. And required the requisite clearances! And does not require a "matchbook advanced degree." I misread, the citizen was not a resident in the ELANCO district. A state takeover can't happen soon enough. When Dr. Hollister quotes " I have an affinity for Columbia". Sounds like a pity party! Hollister is coming to cut jobs and make the bottom line look like he is saving the district money, which it could do, but at who's expense? All those loving the idea, watch your back. Yes, he spoke with pride about furloughing teachers and outsourcing services. Just like in industry. He is a headhunter. Cut staff and it is at the expense of the students. True, we may be top heavy with administration, being he starts to cut teachers,that is bad.Going to be an interesting year with Hollister at Garden Spot and a person who created a position at Columbia. Maybe one of job cuts will be director of operations, if cuts are in the future. The district was paying about $115,000 for a superintendent that left suddenly. She had a background in education and now we are paying 94,000 salary plus 30,000 in benefits to somebody with NO background in education. Sounds like a setup. You're right. The numbers don't make sense. Columbia taxpayers are footing the bill for the shared services agreement, so, yes, we are paying his salary. Correction, CBSD is paying a total of $165,000 for this mess. Just look over the last two years how many administrators left the district and how Mr. Rhoads was downgraded from his position as CHS Dean/Athletic Director, now back in the classroom, teaching Ecology. That leaves Mrs. Maura Hobson with 400 students to administer and 35 teachers to evaluate and observe - without a Dean of Students. So are we saving money?????????? Then the district hires Anthony Sottasante as District Wide Director of Extra-Curricular Activities, a 12 month part time Average 25 hours per week to handle Mr. Rhoads' Athletic Director position. Mr. Rhoads salary was cut approx. $20,000 but then increased the new Extra Curr. Act. position by $5,000. Managing all the ex-curr. positions, can he do it in 25 hours per week, probably not!! Columbia is ABSOLUTELY paying for this! Get your head out of the sand and get your facts straight. WHAT are you thinking???????? Columbia taxpayers are most certainly paying the contracted amount of $165,000. The "benefits" are paid by ELANCO and they get to call ALL the shots. How's that for a deal? So sorry, the benefits are under ELANCO's umbrella, but included in the $165,000. If I'm wrong on that Cole, please correct. Columbia tax money is paying for Mr. Strickler's benefits package from ELANCO. When we are giving them $160,000 for that position, yes we are paying for it. On top of that, they are putting the leftover $30,000 into their general fund,why not give it back to Columbia. Also, since job is new, why not start at the low end of salary, $85,000, not $94,000. I can also see Mr.Strickler asking for an assistant, saying job is too much.If that happens, who pays. I believe they(ELANCO and Strickler) have the taxpayers of Columbia. How can one talk with pride about cutting jobs. Granted it may happen, but when I knew I had to tell good employees that I had to lay them off, many times just temporarily due to order demands, I could not sleep the night before or day or 2 afterwards.You harm families when this occurs.It should be the last resort. Not only are we paying for the service which Elanco oversees, but sounds like we are powerless and have no voice in the decision making process. The elanco board and their staff made the decision and residents and their representatives from cokumbia had no input into the decision and are not allowed to speak at the elanco meetings. The denial of the right to speak due to not being a elanco resident really shows that in essence elanco has taken over our district. Further more this sounds like this issue is going to get bigger and bigger if furloughing of staff and services is on the table as these decisions will be made independent of the residents of the boro and the their representatives. I don't know what happened to this comment. Must be a Google glitch. Sorry. Anyone else curious as to WHY they wont release the names and qualifications of the other applicants?? While "technically" the paycheck will come from ELANCO, the $165k is being paid from Columbia to ELANCO. Do you really think ELANCO is paying Strickler from their own funds???? So our board forced out a superintendent that was showing score growth and reduction of discipline issues, had to buyout her contract, converted the unemployed, volunteer past president into the highest paid person in the district??? Wake up Columbia, we have been played. It was explained something like this: Those applicants that were not chosen would not want their employers to know they were/are out applying for other jobs. Too bad not all residents have internet access. Cole,you are doing a great job keeping us informed about the school matter. I am sure if more people found out what is happening to our schools,teachers and students, the outcry would be tremendous. Keep up the good work. I read in the LNP that Strickler worked for the state under Corbett's reign. Was that patronage job, or did he have to go thru the regular application process. I believe it was an "appointment". Thanks Watcher for the info! I wonder why he was not there very long. This type of job should not fall under a Governor's Cabinet position. Maybe he ran out of handshakes up at the State Capital. Energetically searching for a Senior Operations position with a Dynamic Organization! The only thing he has shown on income management in Columbia is to have the elderly eat cat food and foreclosures. Here's one that I still cannot figure out...the citizen was not allowed to speak about a current issue of concern, but a resident of ELANCO district was permitted, during the citizen comment segment, to stand before council and pray into the microphone. There is to be a separation of church and state. This was a school board meeting held in the school. What is going on????????? Correct. It was during citizen comments. It was not part of the traditional moment of silence or invocation at the beginning of the meeting. It was presumptuous for the board to assume everyone in the room was of that faith and ok with it. Imagine if all residents used the comment time to do this, what would get done besides "his will" and that's not working out so well. I checked the minutes from prior meetings and apparently this is routine for the board to allow this man to pray during citizen comments. This time should be allowed for comments not prayers. Thanks Tom (or Tom supporter)! Running for office does NOT guarantee you a win, so how is that part of the solution? So instead of addressing and confronting what is wrong, your answer is to move?? What the hell does that solve??? I heard a rumor and often they are threaded with some truth. Some running for board seats were pressured to change party affiliation in order to secure the seat and make certain that others did not get elected. 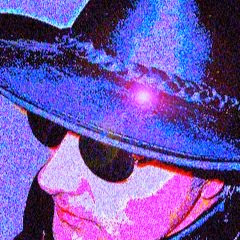 We are deeply invested in this community, why would we move because the powers that be are corrupt? That is crazy. So by that logic, they can run us out of town. Just who will be left here to foot the bill? Dr. Hollister is the CBSD's superintendent. I understand that he was not returning calls, so why not go to the meeting, he is representing our district? You say run for office, take example for how the position played out for Mr. Resch's replacement. There was an Hispanic women that interviewed for the position and I heard highly qualified for the position. Who was picked? Mr. Combs, a previous board member who resigned during his term. The boys already had their man in play so he could help out with the votes. No chance for the female, first-timer that wanted the position. Rotten fish in the water, again!!! Yes, you could move, if you can sell your house. People are not flooding into Columbia. House prices are down due to high taxes. Please say to stay away from Columbia because of high taxes!!! To get out of Columbia, homeowner are loosing major bucks just to unload them to the investment market and landlords. No wonder more and more landlords are willing to offer section 8 rentals. Now, I understand why. The comment about changing party affiliation no sense since you can cross file school board. Oh yes I agree with the end result of what you're saying. Call it "stacked the deck", "strong armed", "blackmail", "manipulation", "coercion", etc. It's all the same in the end. The decision was made and the documents created around specific school board members to help them gain the jobs they wanted. Nothing to do with what was best for students or taxpayers or even who was the best candidate. Thank you for spelling that out clearly. People should know. This is nothing but a HUGE insult to OUR collective intelligence! Back when I served on borough council in the 1990's, we left out of town residents speak during citizens comments if it pertained to a property they owned or if an incident happened to them that was borough related. That person should have been able to speak, for this time. In the future,address the Columbia board and if they hold true to their word,Strickler and Hollister will relay to ELANCO board.That I see could be trouble because you may not know if they reported it.Too many loopholes in this arrangement. Wonder what this means? If it applies? By reading this, it sounds like when Strickler resigned his seat, he may have known more than we thought. The whole deals smells fishy. A lot of questions with few answers. Technically, just because he resigned, that doesn't mean it is still not the term for which he was elected. He was elected for the current time period and is now employed in that same time period. Him now being employed goes against this policy. He is ELANCO's employee so he gets around it. We should offer an open invitation to all Elanco school board members to attend our school board meeting on 8/26 and they could see for themselves how our taxpayers really feel about this bogus agreement. The secret curtain needs to be lifted in an open meeting. Let's choose democracy! Thank you for correcting the board meeting date to 8/18. Guess being so about this bogus agreement caused my mistake. My wish would be that the vote by 6 board members could be corrected so easily. ELANCO people aren't going to bother driving up here. The distance between these schools alone is enough to say there's something wrong here. Yes, they should come out and show solidarity even if they do not feel comfortable speaking out. Hope to see standing room only Thursday at Strickler Hall. They should be holding these board meetings in the school cafeteria anyhow. There was reason to spend the tax payers money on all that unneeded décor and equipment they have in Strickler Hall. As we see most of the voting is done behind doors anyhow. Keep raising taxes and driving the elders into foreclosure. Let's remember the elders are the ones that been footing the bill. Who will foot the bill when they can't? My children graduated from Columbia and moved out of Columbia when they had children. Now they have other opportunities that Columbia don't offer and they could afford a larger and nicer home because the SCHOOL TAXES were considerably less. DO WHAT IS RIGHT FOR THE PEOPLE NOT WHAT IS RIGHT FOR YOU! We must remember that our goal is to attack and end the agreement with Elanco. If we eliminate the agreement, then the two main personalities involved become yesterday's news. Potential lawsuits can be discarded and people in Columbia can agree to work together to improve our schools and our image. I agree. The contract needs to end. Those who voted for it should be asked to resign. The motion that was made bypassing the vice president when Strickler resigned should be looked at very closely. When asked why that was done, the answer was that it was a board decision. When? Before the meeting when the motion was made? Who came up with this idea in the first place? Were other districts contacted to see if they were interested such as Donegal, Hempfield etc? If not, why not? Other big ticket expenditures need to be put out on bid. Was this. I cannot attend the meeting. I hope someone asks. If 6 board members can sell the soul of our prideful district for a savings of $8000, then maybe someone should offer them $8001 to end this agreement NOW. So of anybody has read the document, surely you have questions. I understand wanting to share the services of the superintendent to save some money. However, it should have stopped there. We should not have given away any authority to hire the person who is treated and will be acting as a CBSD employee. Nor should that person have a hiring capability. 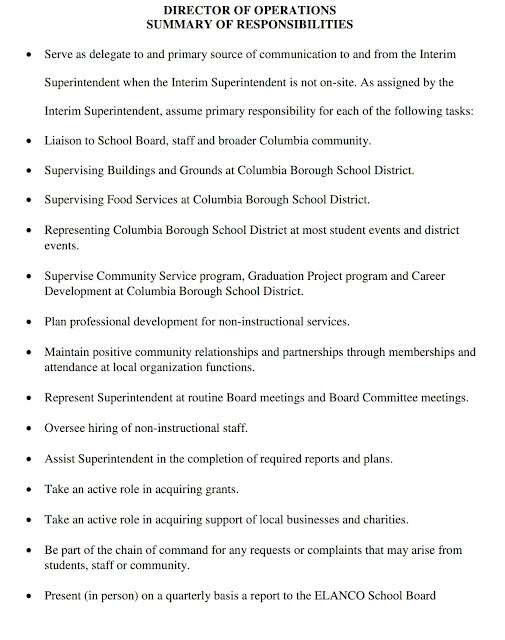 According to the documents, the DOO is basically acting as the superintendent, in the superintendents absence. 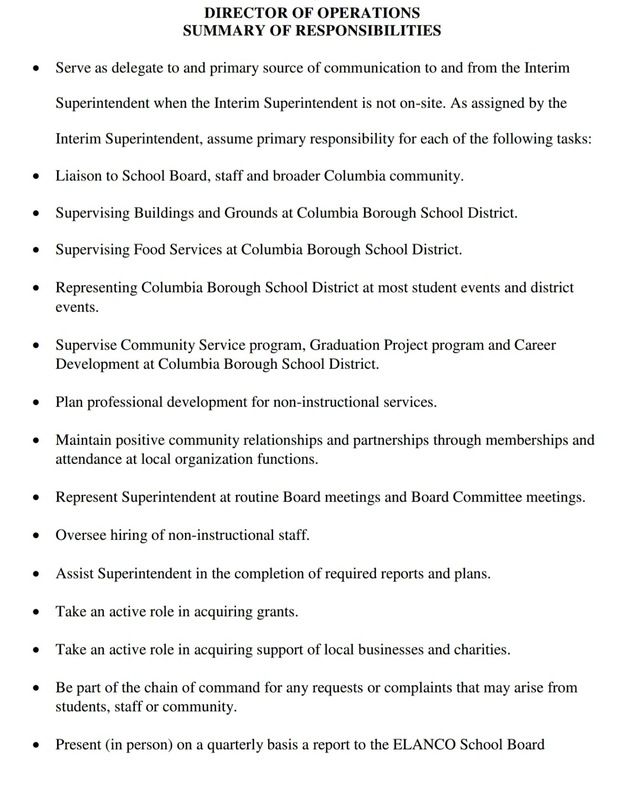 So why isn't the DOO job description and responsibilities more resemblant of a superintendent instead of a "social worker"? A social worker's job description includes much more than the one proposed for Strickler. Don't insult the social workers who actually work to better people's lives. Prayers are needed for Columbia!!! Time and a place for them.